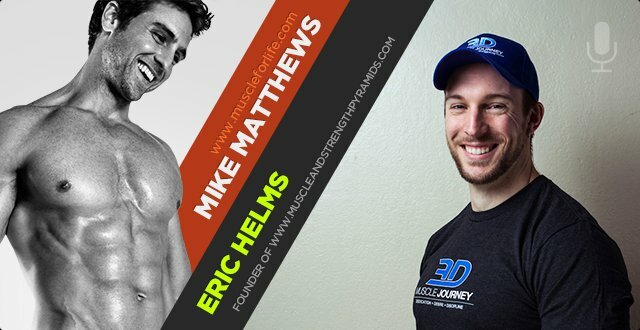 In this episode I have Mr. Eric Helms back on the show, as promised a bit ago, to talk about how to “bulk” properly. In other words, how to gain as much muscle and as little fat as possible. I’ve referenced his work quite frequently in my own writing, so it’s a pleasure to interview him and pick his brain about the science of making gains. This time we’re talking about how to gain muscle quickly without just getting fat. As you probably know, some fat gain is inevitable during a proper bulk, but most people make a handful of common mistakes that not only sabotage their efforts to gain muscle but set them up for a long, grueling post-bulk cut that, in many cases, more or less wipes out the progress they made. The good news, though, is when you know what you’re doing, you can gain significant amounts of muscle without gaining large amounts of body fat, and it’s not as hard as many people think. So if you want to know how to gain strength and size without packing on pounds of fat, you definitely need to listen to the interview. 2:58 – What are some of the common mistakes people do when trying to gain muscle and strength? 6:21 – Can you keep your body fat at a specific percentage and still gain muscle? 8:37 – What is your advice on mini bulk cycles? 14:29 – What are the common training mistakes when bulking? 23:04 – What is the proper diet and nutrition plan when bulking? 36:39 – What are the most common diet mistakes when eating at restaurants? 42:45 – How do things change on the training side when bulking? 48:14 – Are there any differences in exercise selection when programming a cut verses a bulk? 57:32 – What supplements do you recommend for strength and muscle mass? 1:06:14 – How can people connect with you and find your work? 5:34 – What are some of the common mistakes people do when trying to gain muscle and strength? 8:57 – Can you keep your body fat at a specific percentage and still gain muscle? 11:13 – What is your advice on mini bulk cycles? 17:05 – What are the common training mistakes when bulking? 25:40 – What is the proper diet and nutrition plan when bulking? 39:15 – What are the most common diet mistakes when eating at restaurants? 45:21 – How do things change on the training side when bulking? 50:50 – Are there any differences in exercise selection when programming a cut verses a bulk? 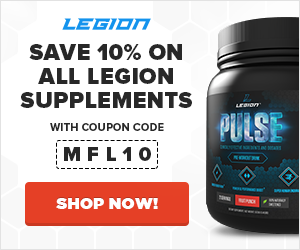 1:00:08 – What supplements do you recommend for strength and muscle mass? 1:08:50 – How can people connect with you and find your work?